The television premiere of events leading to the last Anglo- Asante War of 1900 whose consequences led the Asantehene Otumfuo, Osei Tutu II’s visit to Seychelles in April this year is set to be premiered at the Manhyia Palace on Friday September 25. The Return of a King to Seychelles, written and directed by Mr. Ivor Agyeman-Duah and jointly produced with the Seychelles Broadcasting Corporation is much about the visit to the Indian Ocean Island by the Asantehene Otumfuo, Osei Tutu II and also reflects events 120 years ago which led to the arrest and exile of his uncle, Nana Agyeman Prempeh and 54 others by the British for 27 year old. Interestingly, the British High Commissioner to Ghana, Jon Benjamin will be the guest speaker at the premiere organized with the Palace by the Centre for Intellectual Renewal and Global Media Alliance. 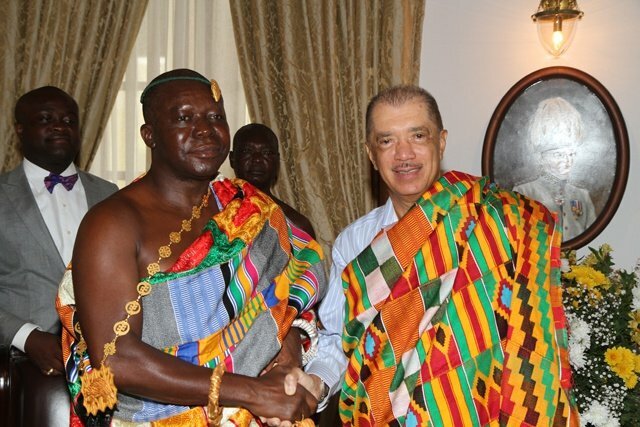 A select audience of 250 will include half a dozen of Nana Agyeman Prempeh’s descendants travelling from the Seychelles on Otumfuo’s invitation for the Akwasidae festival of Sunday September 27. Other invited guests include former presidents, Rawlings and Kufuor. The documentary is a sequel to Yaa Asantewaa: The Heroism of an African Queen by Mr. Agyeman-Duah which was premiered ten years ago at The Royal Institute of International Affairs (Chatham House) in London. It is described by the High Commissioner, Jon Benjamin as contributing to better understanding. Speaking to the Ghana News Agency in Accra, Mr. Agyeman-Duah, a Research Associate at the African Studies Centre at the University of Oxford who was tasked by the Asantehene to lead the Seychelles-Asante 120 Year Project explained that, the National Archives of Seychelles was generous to share over a 1,000 correspondence of Nana Agyeman Prempeh and that this would be presented to the Asantehene at the Akwasidea festival as well as over a century and half old collection of photos and other documents recently acquired. “These are invaluable art work of ancient Asante’s architecture and history capable of revival at least as eye witness accounts ” Mr. Agyeman-Duah whose companion booklet to the documentary of the same title, The Return of a King to Seychelles with its DVD will be released after the premiere,” he explained.